1970's Cased Glass Lamp... Italian/Scandi/Other? 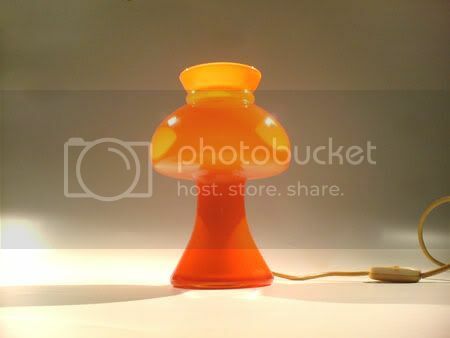 Topic: 1970's Cased Glass Lamp... Italian/Scandi/Other? My past experience of Italian cased glass is that it has just two layers of glass; white opaque then transparent coloured. 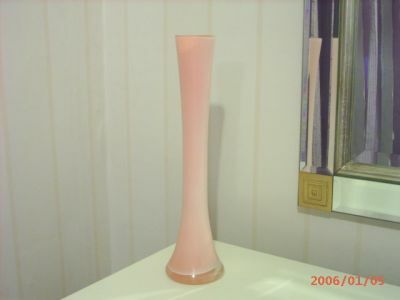 This lamp has three layers; opaque, coloured, and then clear - which I would usually associate with Scandinavian glass. Also the orange colour is even across the whole piece and with the Italian cased glass I've owned there are usually darker striations dotted about. 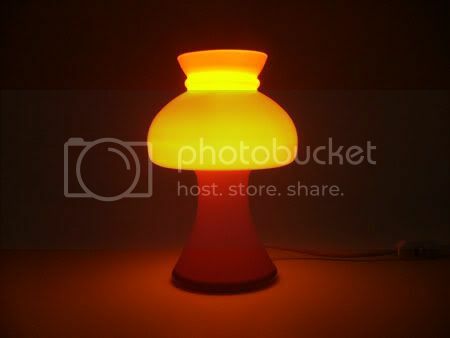 The top part of the lamp looks lighter in the first photograph because the glass is thinner and the light source is from behind... but it is all the same shade of orange. You have prompted me to examine mine and from the base rim it also appears to be 3 layers ! 3 layer would indicate better quality, ditto eveness of color which does seem to be a Scandi trait but that's all I can say. Don't discount the Italians too quickly - there are all grades of quality from Italy. Is yours heavy too ? Does the bulb go in from the bottom or the top on yours ? Mine's not too heavy - just a touch over 1.2kg. The bulb goes in the top - and it's a right pain, I can tell you. And I've got tiny hands. Lord knows how people with normal hands are supposed to manage it! I can see why you fell in love with yours, though - that colour is gorgeous! Oh, and the clear layer is quite abvious on mine as the glass on the base of it is reasonably thick. Odd, I've just noticed that there are two coloured layers in there... :? And I stand corrected with my experience of Italian glass - I just took a closer look at another cased lamp I have (labelled Made In Italy) and this has a (very thin) clear layer also. Yours would appear to be orange (on the inside ?? !!! ) then white then clear.....but logically ...... :roll: ? Colours give any clues ? If you find any lighting catalogues for this style & era please let me know ! Nope, it's white on the inside, then two different shades of orange, and then clear on the outside... Very peculiar! 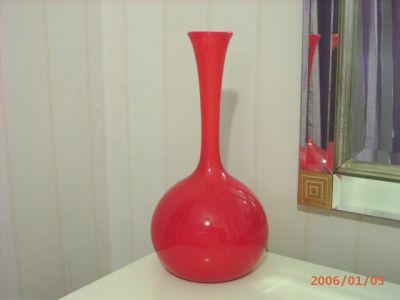 I've just seen a bright orange vase with a sticker saying Opalina Fiorentina (from Empoli). I'm wondering if they also produced triple cased glass as well. It isn't a lamp shade but it's the same sort of Opalina or whatever you call it. 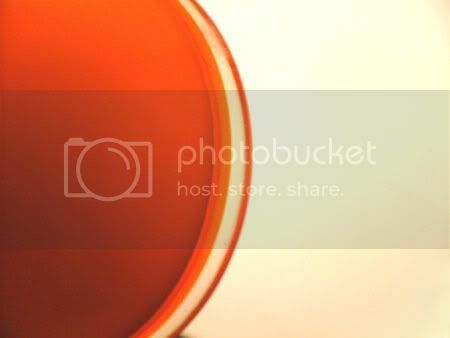 Here's some orange Italian glass. 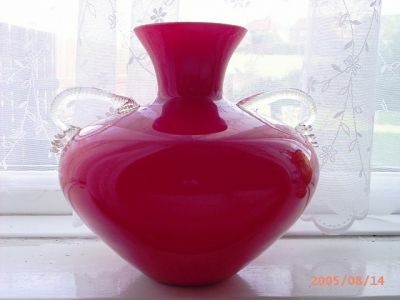 Your orange/white/orange vase (first one shown) is very similar in shape to one I have which is definitely Italian. I have a set of 4, two of which have "Made in Italy" labels. However mine are just one colour. Your clear/white/orange (#2) looks very Polish to me, and quite modern, but I could be wrong. The orange/white/orange, the woman I bought it from said that it was 1950's. I always thought that these were 1970's because of the bright colours. The clear, white, orange has a thick clear casing so perhaps it is Polish. There is a lot of ware to the base even more so than the other one's. Vistosi - Lampada da tavolo (table lamp) several designed by E Capuzzi - simple coloured lamps lit with bulb from inside, very similar shapes. I used to think all the simple glass was usually Scandinavian but recent book buys have shown me a lot of vases and 'table sets' by Nason, Fratelli, Barovier, Salviati, and Vistosi were very simple. Page created in 0.682 seconds with 28 queries.